There is a place, like no other. Where a walk down Main Street can fill you with wonder. Where laughter and joy have no limits and there's so much to experience, one day just isn't enough. So make the time, to take your time. Because here, there is Magic For Days. Experience the lap of luxury in the heart of Anaheim. 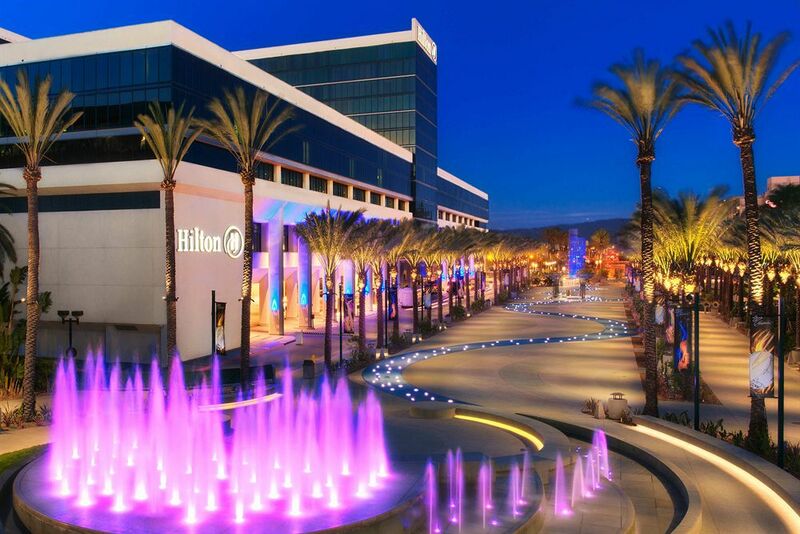 Located 2 blocks from the Disneyland Resort, the Hilton Anaheim—the largest hotel in Orange County—offers something for everyone, including an abundance of culinary options, 2 swimming pools, a 25,000-square-foot health club, plus upscale accommodations and amenities to make your stay memorable. Located in Anaheim (Anaheim Resort), Hilton Anaheim is within a 10-minute drive of Disneyland® and Disney California Adventure® Park. This 4-star hotel is 2.4 mi (3.9 km) from Angel Stadium of Anaheim and 2.9 mi (4.7 km) from Honda Center. Make yourself at home in one of the 1572 air-conditioned rooms featuring refrigerators and flat-screen televisions. Your pillowtop bed comes with down comforters. Cable programming and MP3 docking stations are provided for your entertainment, while complimentary wireless Internet access keeps you connected. Private bathrooms with shower/tub combinations feature designer toiletries and hair dryers. Relax at the full-service spa, where you can enjoy massages, body treatments, and facials. You're sure to appreciate the recreational amenities, which include 2 spa tubs and a health club. Additional features at this hotel include wireless Internet access (surcharge), concierge services, and babysitting/childcare (surcharge). The shuttle (surcharge) will take you to the nearby beach or shopping center. Grab a bite at Starbucks, one of the hotel's 4 restaurants, or stay in and take advantage of the room service (during limited hours). Snacks are also available at the coffee shop/café. Relax with a refreshing drink from the poolside bar or one of the 2 bars/lounges. Buffet breakfasts are available for a fee. Featured amenities include a 24-hour business center, express check-in, and express check-out. Planning an event in Anaheim? This hotel has 140000 square feet (13006 square meters) of space consisting of conference space and meeting rooms. Self parking (subject to charges) is available onsite. Featuring modern amenities, friendly service and a contemporary atrium with an eternity pond, this hotel—located 6 miles from Disneyland Resort—is sure to complement your Disney vacation. 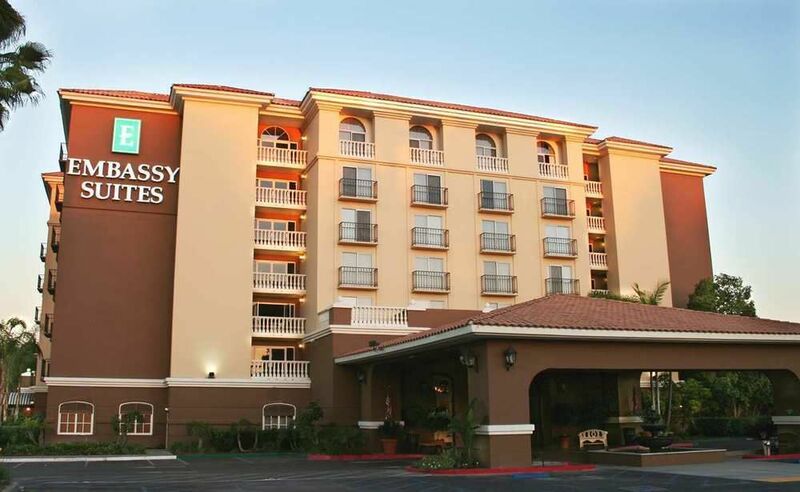 When you stay at Embassy Suites Hotel Anaheim-North in Anaheim, you'll be in the suburbs and close to Village at Orange and California State University Fullerton. This family-friendly hotel is within close proximity of Anaheim Tennis Center and Hope International University. Make yourself at home in one of the 223 air-conditioned rooms featuring refrigerators and flat-screen televisions. Rooms have private balconies. Cable programming and video-game consoles are provided for your entertainment, with wired and wireless Internet access available for a surcharge. Bathrooms have complimentary toiletries and hair dryers. Enjoy a range of recreational amenities, including an indoor pool, a spa tub, and a fitness center. Additional amenities at this hotel include wireless Internet access (surcharge) and gift shops/newsstands. Spending a day of fun is easy with the theme park shuttle (surcharge). Enjoy a meal at the restaurant, or stay in and take advantage of the hotel's room service (during limited hours). Mingle with other guests at the complimentary reception, held daily. Wrap up your day with a drink at the bar/lounge. A complimentary cooked-to-order breakfast is served daily from 6 AM to 9 AM. Featured amenities include wired Internet access (surcharge), a 24-hour business center, and express check-in. Event facilities at this hotel consist of conference space and meeting rooms. Self parking (subject to charges) is available onsite. 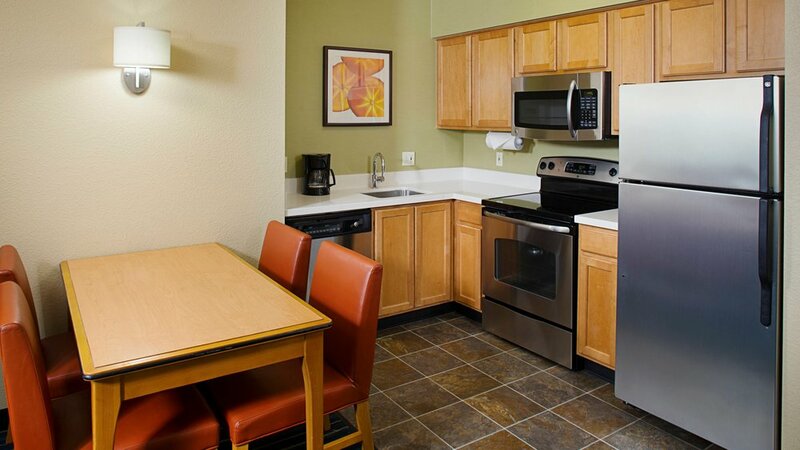 At the Residence Inn Anaheim, enjoy the comforts of home in a spacious suite that includes a fully-equipped kitchen. 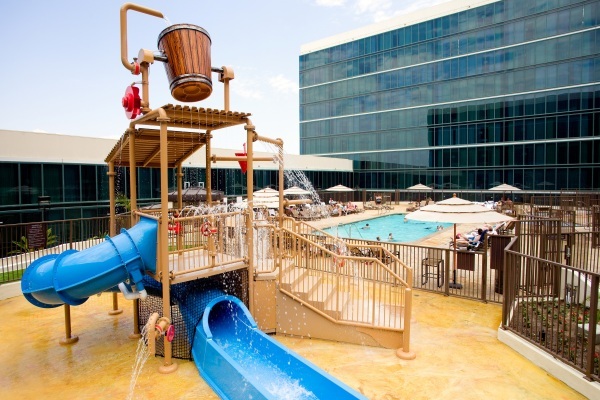 Located a mile from the Disneyland Resort, this smoke-free, 200-room hotel also includes an outdoor swimming pool, a fitness center and an onsite playground—plus plenty of space for family and friends. 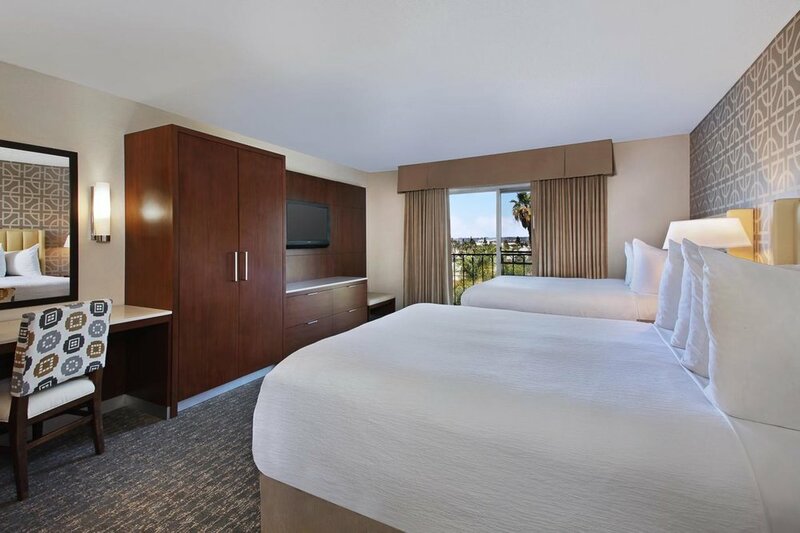 With a stay at Residence Inn By Marriott Anaheim Resort Area in Garden Grove (Anaheim Resort), you'll be a 5-minute drive from Crystal Cathedral and 7 minutes from Disney California Adventure® Park. This family-friendly aparthotel is 1.3 mi (2.2 km) from Disneyland® and 9.4 mi (15.1 km) from California State University Fullerton. Make yourself at home in one of the 200 air-conditioned rooms featuring kitchens with refrigerators and stovetops. 32-inch Smart televisions with cable programming provide entertainment, while complimentary wireless Internet access keeps you connected. Conveniences include phones, as well as desks and complimentary weekday newspapers. Don't miss out on the many recreational opportunities, including an outdoor pool, a spa tub, and a fitness center. This aparthotel also features complimentary wireless Internet access, concierge services, and an arcade/game room. If you're planning a day at a nearby theme park, you can hop on the shuttle (surcharge). Grab a bite from the snack bar/deli serving guests of Residence Inn By Marriott Anaheim Resort Area. Meet other guests and eat at the complimentary reception. A complimentary buffet breakfast is served daily. Featured amenities include a business center, express check-out, and complimentary newspapers in the lobby. Event facilities at this aparthotel consist of conference space and meeting rooms. Self parking (subject to charges) is available onsite. Give us a call or shoot us an email should you have any questions or are ready to book! Prices and availability subject to change until deposit is paid. Prices quoted above are only valid for the number of Guests, check-in dates and length of stay shown. They do not include other costs you may choose to incur during your stay. Photos are representative of hotel offerings. Specific rooms cannot be guaranteed and room reservations are subject to change and availability pursuant to the hotel’s booking policies. Walt Disney World Resort - Purchase of dining plan does not guarantee availability at participating restaurants. Reservations may be required. Learn more about Disney dining plans. Multi-day tickets must be used during the valid ticket dates. See package details. Water Parks subject to rehabilitation, seasonal and weather closures. Certain age restrictions may apply for access to certain facilities. Does not include activities/events separately priced. Disneyland Magic Morning allows one early admission into select attractions, stores, entertainment and dining locations at Disneyland Resort Park before the park opens to the general public. For admission, each member of your travel party (ages 3 and older) must have a valid 3-day or longer Disneyland Resort theme park ticket purchased online. Tickets purchased at the Ticket Booth do not include the Magic Morning entitlement. To enhance the Magic Morning experience, please arrive at least one hour and 15 minutes prior to regular park opening. Magic Morning early admission is based on availability and does not operate daily. Applicable days and times of operation and all other elements including, but not limited to, operation of attractions, entertainment, stores and restaurants, and appearances of Characters, may vary and are subject to change without notice. Subject to capacity, cancellation and other restrictions. Star Wars: Galaxy's Edge will not be available during Extra Magic Hour or Magic Morning at Disneyland Park.Prices quoted above are only valid for the number of Guests, check-in dates and length of stay shown. Some activities, recreation, dining and child care services are not included in the cost of your stay. Multi-day tickets must be used during the valid ticket dates. See package details. Certain age restrictions may apply for access to certain facilities. Does not include activities/events separately priced. Saved offers are subject to change and not guaranteed until purchased.